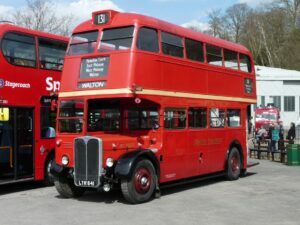 The history of an individual London bus is often complicated because, from the 1920s to the 1980s, most of them received a new identity (registration/chassis/fleet number) each time they left the central works after overhaul. In addition, bodies and chassis were also often interchanged. RT2657 was no exception to this identity-swapping: both the chassis and the body were built in 1948 – the chassis entered service under RT501 and the body on RT677. They both then went through a number of different combinations and identities before leaving works for the last time in 1959 with today’s identity of RT2657. The original bus to carry that identity was built in 1951 but today’s RT2657 has no connection with that bus other than the number! Our bus saw its final service days at New Cross garage in 1960-61 and then at nearby Peckham from 1962-64. 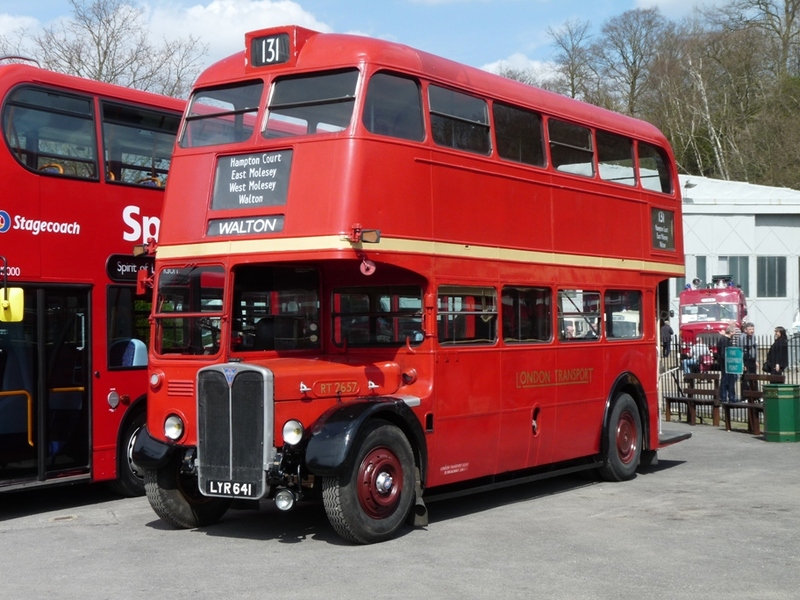 By this time, new Routemasters were replacing the RT-family buses and London Transport was disposing of the earliest RTs, in particular those like 2657 which carried the early, ‘roofbox’ bodies with the front route number positioned on the roof. Some were sold for further service, others went for scrap but 2657 was very different in that it was acquired by the Paris transport museum (which already owned a London trolleybus) and it left the UK for its new home in 1965. RT2657 then spent the next 48 years in Paris, usually hidden from view in a storage depot but occasionally venturing onto the road, for which it received a Paris ’75’ registration number. Apart from a fresh coat of red, it remained largely unaltered from its final service condition in London. By 2012, the Paris museum was facing a considerable reduction in its storage capacity and London Bus Museum was offered the bus for its collection. In February 2013, ownership passed to LBM for the symbolic amount of one Euro and the bus was towed back to the UK. The bus is in very reasonable condition, apart from the roof which will need to be rebuilt and the need for a full re-trim. It will have to await its turn in the workshop but the intention is to put it back to full operational condition when it will join the Museum’s working fleet. Vehicle Classification: RT. It has never been established what this stands for – Regent Type and Revised Type are unlikely – and it may just have been the next code to be used in AEC’s development department.